Silca addressed the valve extension problems that plague so many racers: leaking, rattling and clicking – and came up with removable core valve extensions that are made with the same attention to detail as Silca's pumps. Silca RVC extensions solve air leakage problems from poor thread fitment two ways: with elastomer gaskets and a thin film of sealant on the threads. A ribbed gasket on the outside of the extension prevents rattling and clicking inside the rim. Made in USA from CNC 6066-T6 aluminum with elastomer gaskets. 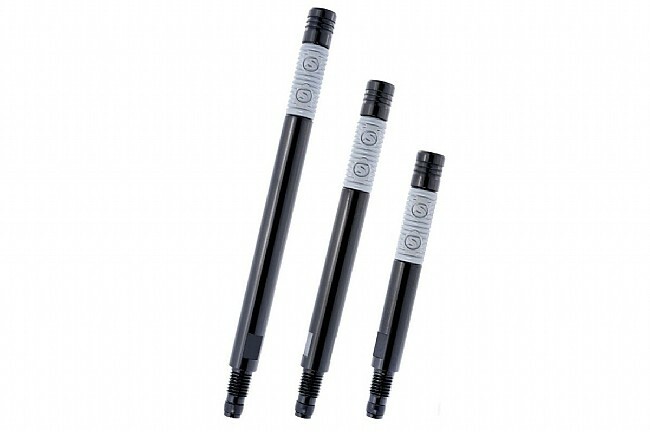 For use on tubes or tires with removable valve core. Package contains 2 extensions and tool for removing valve core and tightening extension. Available in 34 mm, 45 mm, 60 mm and 75 mm.